Savor the big bold Lancaster Estate Reds with delectable paired bites prepared by our Executive Chef. Relax and enjoy live music and when you're ready to cool off, join us in the wine cave with Winemaker, David Drake, and Assistant Winemaker, Alicia Sylvester to sample our barrel futures of cabernet franc and Malbec. On your way out don't miss our 2010 Cabernet Sauvignon paired with a sweet treat. 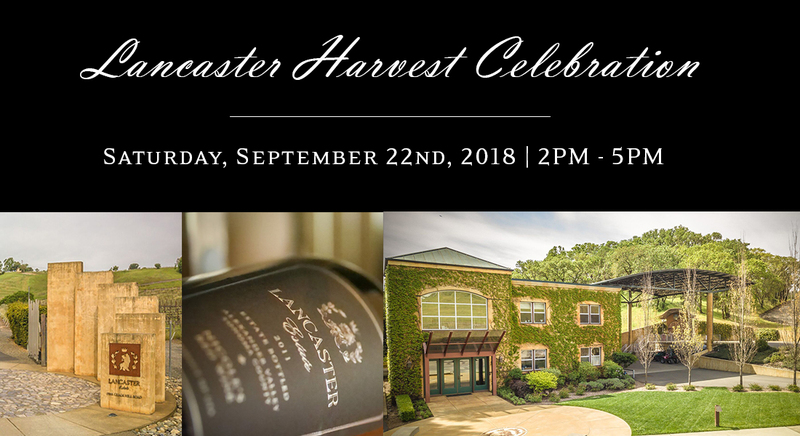 You won't want to miss this exclusive opportunity to secure futures of our small production, special release, Harvest Celebration Wines! 2017 Reserve Sauvignon Blanc – Only 25 cases of this 100% concrete-fermented beauty were produced, and this is the last year we plan to make it. 2016 Reserve Malbec, Block 13 – The 2016’s are very impressive wines, with bold fruit, and elegant tannins, and so, our Malbec from this vintage is better than ever. 2016 Reserve Cabernet Franc, Block 16 – Yes, we did it again. But it’s bigger, badder, and bolder, and fortunately, we have two barrels instead of one, because a lot of people missed out last year. Still, that’s only 50 cases. We would like to let all of our wine club members know that there is a limited production of our 2015 Cabernet Sauvignon so this will not be released until after the harvest party in October. To claim your 2 complimentary tickets, please email concierge@foleyfoodandwinesociety.com or call us at (855) 883-8688. Adults 21 and over only please. Dogs are allowed.